Call today and ask about having Dr. Snappy & Sam make a personal appearance at your Mom’s group, PTA or any event! Stop by our office today and get an autographed copy for yourself and a friend! In this introductory, comic-style book, meet Dr. Snappy & Sam, and the colorful collage of characters that make up his adventures into the world of Chiropractic. From the mind of Dr. Eric Benedetti, kids of all ages can embrace the world of healing and caring for the nervous system in order to live a healthier, happier lifestyle! Dr. Eric grew up hearing about his Mother going to the chiropractor for sciatic nerve pain. Each time she came home she was better. Eventually his brother Scott went for asthma and got better as well. During Dr. Eric’s childhood, several ailments plagued him such as: common colds (4-5 times per year), left shoulder pain, nose bleeds and hypoglycemia. After years of failed medical treatment, Dr. Eric was again introduced to chiropractic at the age of 18. Since getting his spine adjusted, all of the ailments have disappeared. The sad news is the 6 years of health lost from age 12 – 18. Even though Dr. Eric’s Mother & brother had gone to the chiropractor, he did not connect his health to the lack of nerve flow to the body. Even more astonishing is the fact that kids today have no connection on how to keep their spines healthy. The mission is simple ‘To educate kids on the importance of a healthy spine’. That way was to bring the magic of chiropractic to the children through stories. 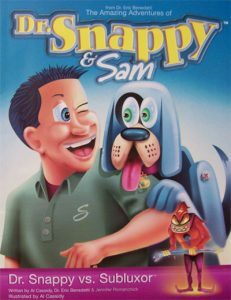 That’s when Dr. Eric created the character’s Dr. Snappy & his dog Sam. Every hero has an enemy. Kids remember the bad guy, Subluxor, and they don’t want him lurking in their body. This is the first story with many more to come. Enjoy “The Amazing Adventures of Dr. Snappy & Sam”.